Mr. W. was brought to my office in a wheelchair by one of his daughters for a problem with his leg. In his late eighties and ravaged by age, his skin was pale and swollen from anemia and congestive heart failure, and a gray beard was draped over his chest. While helping him onto the examining table, his sleeve pulled up and I got a glimpse of the tattoo on his left forearm. It was hard not to gasp but I tried not to show my reaction in accordance with the rules of bedside manner. When tattoos get old, pigments spread within the skin and what was once a thin line becomes an ugly blur. This tattoo was over sixty years old and was ugly from the day it was placed, because it was given as an identification mark by people who worked in the concentration camp named Auschwitz-Birkenau where he was transported in a cattle car after being taken from his home in Hungary. He was lucky in a bizarre sense, because those who didn’t get the tattoo were sent directly to die in a gas chamber. I avoided mentioning anything about the tattoo during his first appointment. Some weeks later on a subsequent visit, as we were wrapping up the treatment I mentioned the tattoo. Mr. W. was tired and didn’t want to talk, but his daughter gave me some background. As the sole surviving member of his family he settled in America and started a family, and now has seven children and a growing number of grand-children. Despite his shattering experiences in Europe he maintained his faith and ultra-orthodox Jewish traditions. She also told me an unexpected result of her father’s tattoo. “In our community when someone goes to Israel, people place personal prayers into cracks of the Western Wall in Jerusalem. 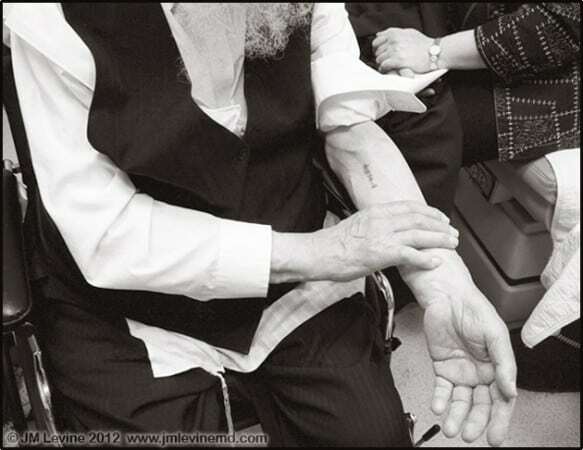 Our Rebbe said that if you don’t have the money or opportunity to go to Israel, just give your prayer to someone with a tattoo like my father.” She added that she would find hand-written prayers on scraps of paper in his pockets when he returned from synagogue. I explained that I photograph aging, and that it would be important to photograph Mr. W’s tattoo as it opens a door to history. They agreed, provided that it does not show his face, and that I make prints for his children. As a doctor I frequently get privileged access into people’s lives, and worlds open up that would otherwise remain unseen or forgotten. And so I am posting a scan of my black and white photo of Mr. W’s tattoo. Take a look and learn about human cruelty and a man’s resilience, strength, and survival. My aunt, who is from Poland, survived the camps along with her sister, who passed away recently. Celina married my uncle Isaac and they live in Maplewood, NJ. She suffers from Alzheimers. She has a tatoo. She never talked about her experience as a young girl. Why would she? A very moving story. Thanks for telling it. Another one of your amazing stories. My in-laws were survivors of the Armenian massacres and the stories they shared only very late in their lives were amazing. Thank you for all your touching stories and pictures.. This is such a compassionately written article. Being a geriatric Physical Therapist, I often find myself wanting to document the incredible lives and stories of my patients. You have done this in a very human way. I am excited to read more! Abe the shoemaker in Rockaway Beach NY. Remember seeing his number as a child and Mom explaining what it meant. The memory and feelings so vivid for me. I wanted to cry. Thank you for sharing.